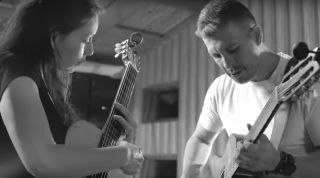 Rodrigo y Gabriela Premiere New Song, "Mettavolution"
GW's got an exclusive on the title track from the acclaimed acoustic duo's new album. Listen here. Veteran shred guitarist Marty Friedman’s recent trip to California from his home in Japan was anything but a vacation. We’ve created our own, premiered some great ones, and searched out some really fabulous video finds. Now we've looked back through 2014 to find our favorite videos from this year. Check 'em out! On August 17 at Red Rocks Amphitheater in Colorado, Metallica bassist Robert Trujillo sat in with his good friends, acoustic guitar rock sensations Rodrigo y Gabriela, at their sold-out show. No late night show is complete without a special musical guest to close out the program. From Springsteen to Ed Sheeran, here are six special performances that were captured on late night TV.